Type 1 diabetes is an autoimmune disease resulting from the destruction of insulin-producing beta cells. Along with advances in generating replacement beta cells for treating diabetes, there is also increasing demand for non-invasive tools to evaluate the recurrence of autoimmune attack on transplanted tissue. Here, we examined the anterior chamber of the eye as a potential islet transplant site, and also evaluated whether in vivo imaging of the islets transplanted in the eye could enable real-time visualisation of autoimmune processes underway in the pancreas. Syngeneic islet equivalents were transplanted into the eye or kidney capsule of streptozotocin-induced diabetic C57BL/6 mice to compare islet dose (25–125 islet equivalents) and function across transplant sites. Autoimmune attack of syngeneic islets was evaluated in the pancreas and eye tissues of NOD and NOD-severe combined immunodeficient (SCID) mice given diabetogenic splenocytes. Islet transplantation in the eye decreased fasting plasma glucose levels and increased weight gain and survival in an islet-dose-dependent manner. Even 50 islets in the eye reduced blood glucose levels, whereas ≥200 islets were required in the kidney for a similar effect. Autoimmune destruction of pancreatic islets in the eye mirrored that in the pancreas and could be visualised in real time by non-invasive imaging. We found that far fewer islets were required to restore normoglycaemia when transplanted into the anterior chamber of the eye vs the kidney capsule. However, our results suggest that islets are not protected against autoimmune attack in the eye, making this a suitable site for visualising autoimmune processes against transplanted tissue. The online version of this article (doi: 10.1007/s00125-013-3004-z) contains peer-reviewed but unedited supplementary material, which is available to authorised users. Type 1 diabetes is a severe, chronic autoimmune disease caused by the loss of self tolerance to insulin-producing pancreatic beta cells, resulting in hyperglycaemia associated with debilitating health complications . Transplantation of insulin-producing cells has shown remarkable potential for treating patients with type 1 diabetes [2, 3]. However, islet transplant recipients require chronic immunosuppression to prevent both allo- and autoimmune destruction of engrafted tissue. It is estimated that more than half of the transplanted islet tissue is lost in the first few days after syngeneic transplantation [2, 3]. The mechanisms underlying this loss are poorly understood, as monitoring the survival of islets transplanted into deep tissues such as the liver remains a clinical challenge despite recent advances [4, 5]. In rodents, pancreatic islets are typically transplanted under the kidney capsule, as this site is easily accessible, highly vascularised and retrievable via survival nephrectomy. Islet graft function can be assessed non-invasively by measuring circulating glucose and C-peptide levels. It is important, however, to consider that both engrafted cells and the endogenous pancreas secrete C-peptide. Therefore, a xenotransplant can be used to specifically assess graft-derived C-peptide levels using species-specific assays. Moreover, direct visualisation of transplanted tissue typically requires an invasive surgical procedure to expose the kidney for imaging and is not practical for longitudinal, repeated imaging and tracking of single cells . Recently, various imaging techniques for evaluating the fate of transplanted islets and the progression of autoimmune diabetes have been examined [5, 7, 8, 9, 10, 11, 12]. Among these, optical imaging provides an attractive imaging modality because it is a non-invasive and non-ionising technique  and can track live cells in vivo by fluorescent or bioluminescent labelling. Fluorescent imaging is hampered by two major limitations: insufficient penetration depth of most fluorescent agents and inadequate resolution resulting from the high absorption and broad autofluorescence of tissues . Even using near-infrared contrast agents or tissue-specific bioluminescence [10, 11, 12], these techniques are not able to attain single-cell-level sensitivity . The anterior chamber of the eye has been a popular transplantation site for decades , as transplanted tissue is readily vascularised and innervated by the iris  and the graft can be visualised non-invasively. As such, specific techniques have been developed for transplantation and imaging of transplanted tissue in the eye [16, 17, 18, 19]. Despite a general belief that the anterior chamber is an immune privileged area due to its anatomical structure and composition of immune cells and soluble factors [20, 21, 22], intraocular islet transplantation has been shown to be well-suited for studying alloimmune responses against pancreatic beta cells . Recently, in vivo imaging of autoimmune destruction of endogenous pancreatic islets was reported at cellular resolution . Mice expressing a viral glycoprotein in beta cells underwent adoptive transfer of T cell receptor-restricted CD8+ lymphocytes towards the viral protein, and cytotoxic T lymphocyte activity was imaged via live microscopy of surgically exposed pancreases. While this approach enables visualisation of immune attack against endogenous pancreatic islets, utility for studying autoimmune attack was not demonstrated. Moreover, this surgical technique is impractical for evaluating the slow process of beta cell autoimmune destruction over prolonged periods. The anterior chamber of the eye offers a window into the body, and we hypothesised that it might be a feasible site for non-invasive imaging of beta cell autoimmunity. In the current study, we first evaluated the capacity of the eye to support islet function in comparison with the kidney capsule by examining the efficacy of multiple allogeneic islet doses for treating streptozocin (STZ)-induced diabetes in C57BL/6 mice. Second, we investigated the feasibility of visualising autoimmune attack of islets in real time through in vivo imaging of islet transplants in the anterior chamber. These studies aimed to determine whether the autoimmune destruction of engrafted islets in the eye mirrored that of islets within the endogenous pancreas. All experiments were approved by the University of British Columbia Animal Care Committee in accordance with the guidelines of the Canadian Council of Animal Care. Male C57BL/6, female NOD-severe combined immunodeficient (SCID) and female NOD mice (8–10 weeks old) were obtained from Jackson Laboratory (Bar Harbour, ME, USA). Mice were housed in the Centre for Disease Modeling facility (Vancouver, BC, Canada) in a climate-controlled room with a 12 h light–dark cycle and provided with water and free access to a standard irradiated diet (Teklad Diet No. 2918; Harlan Laboratories, Madison, WI, USA). Blood glucose and body weight were monitored once or twice weekly following a 4–5 h morning fast. Blood glucose levels were measured via the saphenous vein using a handheld glucometer (LifeScan, Burnaby, BC, Canada). Diabetes was generated in C57BL/6 mice by a single intraperitoneal injection of STZ (180 mg/kg body weight; Sigma-Aldrich, Oakville, ON, USA) 5–10 days before islet transplantation. Pancreatic islets were isolated from donor mice 1–2 days before transplantation, using techniques described by Lacy and Kostianovsky  with an additional filtration step . After overnight culture, islet numbers, purity and viability were assessed by microscopy (live/dead assay; Invitrogen, Burlington, ON, Canada). Islets were hand-selected and washed three times in sterile PBS. Islets of various sizes were picked into groups of islet equivalents (1 islet equivalent = ∼50 μm in diameter) for transplantation. To examine the function of islets in the eye, 25 (n = 5), 50 (n = 5), 75 (n = 6) or 125 (n = 4) C57BL/6 islet equivalents were transplanted into the anterior chamber of the eye of C57BL/6 recipient mice with STZ-induced diabetes. The efficacy of different subcapsular islet doses was assessed by transplanting 50 (n = 3), 125 (n = 3), 200 (n = 3) or 275 (n = 2) C57BL/6 donor islets under the left kidney capsule of C57BL/6 mice with STZ-induced diabetes. Age-matched C57BL/6 mice with or without STZ-induced diabetes received sham surgery (no islet transplant) in the eye (n = 4) or kidney capsule (n = 7). NOD-SCID mice (n = 9) received 30 hand-picked islet equivalents (isolated from donor NOD-SCID mice) in the eye 3 weeks before adoptive transfer of splenocytes from newly diabetic NOD mice. A second group of NOD mice (n = 7) received syngeneic islet transplants in the eye at 8 weeks of age and diabetes was allowed to progress naturally, without adoptive transfer. For islet transplantation into the anterior chamber of the eye, islets were drawn into a micropipette (MXL3-BP-IND-200; Origio MidAtlantic Devices, Mt Laurel, NJ, USA) using a micromanipulator and settled by gravity. The cornea was punctured obliquely using a 27G needle, and the needle was passed into the anterior chamber without damaging the iris. The site of entry was widened with heat-sterilised fine forceps, the micropipette containing the islets was passed into the anterior chamber and islets were ejected using the micromanipulator. The pipette was removed and Isoptears (Alcon Canada, Mississauga, ON, Canada) supplemented with gentamicin (0.3% wt/vol.) was applied to the eye to prevent desiccation and infection. Spleens from newly diabetic NOD mice (4–6 months old, n = 5) were harvested into Hanks’ balanced salt solution (HBSS) containing 1% bovine serum albumin, cut into small pieces and gently mashed between two histology slides. Cells were rinsed with HBSS, filtered with a 0.2 μm cell strainer (Fisher Scientific, Ottawa, ON, Canada), centrifuged (5 min at 1,500 rpm), washed with HBSS, centrifuged again and re-suspended in lysis buffer (ammonium chloride/Tris-HCl, pH 7.5). The cell lysate was centrifuged and washed with HBSS to remove erythrocyte debris. A sample of cells was stained with trypan blue (Invitrogen) and counted via haemocytometry. Twenty-million splenocytes in 100 μl were injected into the tail vein of restrained, conscious, female NOD-SCID mice (11 week old, n = 11). Nine of eleven adoptive transfer recipient mice received syngeneic islet transplants in the anterior chamber of the eye 4 weeks earlier. To visualise autoimmune destruction of islets, live images of the engrafted eye were captured using a Leica MacroFluo (Z16 APO A) (Leica Microsystems Canada, Concord, Ontario, Canada) at three time points before adoptive transfer (day −28, day −8 and day 0) and five time points after adoptive transfer (days 5, 19, 21, 25 and 28). At 45 days post transplant in the islet dosing study, islet recipients with fasting plasma glucose <11 mmol/l underwent an OGTT following a 6 h morning fast. 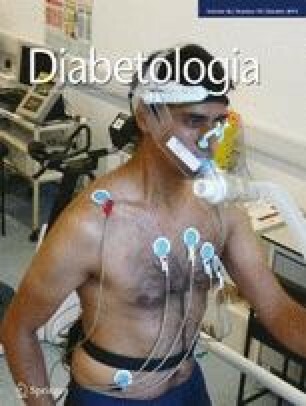 Mice received an oral bolus of 30% glucose (2 g/kg) and glucose levels were measured at 15, 30, 60, 90 and 120 min following gavage. At 47 days post transplant in the islet dosing study, the engrafted eye was surgically removed from the subset of mice that received an OGTT (n = 4) and age-matched non-diabetic control mice (n = 3). In the islet dosing study, engrafted eyes were harvested from all remaining recipient mice (i.e. non-enucleated) at 65 days post transplant. Engrafted kidneys were harvested at 46 days post transplant. In the adoptive transfer study, pancreases and engrafted eyes were harvested from NOD-SCID mice either 2.5 weeks post transfer of splenocytes, before clinical symptoms of diabetes (n = 3), or 4 weeks post adoptive transfer (n = 8 mice in total: n = 3 newly diabetic, n = 3 prediabetic and n = 2 NOD-SCID sham). Pancreas tissue and engrafted eyes were also harvested from transplanted NOD mice without adoptive transfer after 14 weeks of age, but before they developed diabetes (n = 7). Eyes with engrafted islets were placed in Davidson’s fixative (two parts 37% formalin, three parts 100% ethanol, one part glacial acetic acid and three parts tap water) for 24 h at 4°C, then transferred to 70% ethanol for storage. Engrafted kidneys and pancreases were stored in 4% paraformaldehyde for 24 h at 4°C, then transferred to 70% ethanol. Tissues were processed into 5 μm paraffin sections and mounted by Wax-it Histology Services (Vancouver, BC, Canada). The severity of insulitis was determined in sections of pancreas and engrafted eyes collected 2 weeks post adoptive transfer (before diabetes) and at diabetes onset. For mice that did not become diabetic, insulitis was assessed at 5 weeks post transfer. For the spontaneous diabetic group, the severity of insulitis was determined when mice were 4–6 months old or at onset of diabetes. Insulitis was evaluated using haematoxylin/eosin-stained sections; immunostaining for insulin, glucagon and synaptophysin was performed in neighbouring sections to mark the endocrine cells. For pancreas sections, 20–30 islets from three sections (separated by 100 μm) were graded and averaged. Pancreas scoring was based on the system described elsewhere : a score of ‘0’ represented no immune cells surrounding islets; ‘1’ represented peri-insulitis (mononuclear cells surrounding the islet periphery); ‘2’ represented moderate insulitis (mononuclear cells infiltrating <50% of islet area) and ‘3’ represented severe insulitis (mononuclear cells infiltrating >50% of islet area). Immune infiltration grading for the eye was based on the same system. Engrafted islets were located by examining sections at different depths from the eye and staining for insulin, glucagon and synaptophysin. Infiltration of mononuclear cells was scored as follows using DAPI-stained sections: ‘0’ represented no mononuclear cells; ‘1’ represented few mononuclear cells around the periphery of the transplant; ‘2’ represented large numbers of infiltrating cells in the islet area and ‘3’ represented infiltration in >50% of the transplanted tissue. CD3 staining was performed to confirm that the infiltrating cells were T lymphocytes. Tissue sections were deparaffinised and immunostained as previously described  using primary antibodies as follows: guinea pig anti-insulin (1/1,000; Millipore, Billerica, MA), guinea pig anti-insulin (1/1,000; Sigma-Aldrich, St Louis, MO, USA), mouse anti-glucagon (1/1,000; Sigma-Aldrich, St Louis, MO, USA) and rabbit anti-CD3 (1/50; AnaSpec, San Jose, CA, USA). Stained sections were either viewed with a Zeiss Axiovert 200 inverted fluorescence microscope (Carl Zeiss, Toronto, ON, Canada) connected to a Retiga 2000R Fast 1394 camera (QImaging, Burnaby, BC, Canada) or ImageXpress Micro Automated Acquisition system (Molecular Devices, Sunnyvale, CA, USA). Images were analysed using Openlab v5.0.2 (PerkinElmer, Waltham, MA, USA) or MetaXpress software (Molecular Devices). Numerical data analysis was performed using GraphPad Prism v5.0a (GraphPad Software, San Diego, CA, USA). Statistical difference in growth rate was determined by linear regression followed by comparison of regression slopes via one-way ANOVA. Plasma glucose measurements were analysed using two-way ANOVA followed by Bonferroni multiple comparison tests. Plasma glucose changes in response to the OGTT were analysed using two-way ANOVA and comparison of AUC using a Student’s t test. The inter-relationship between the insulitis score in the eye and the pancreas was analysed using a Pearson correlation. We first investigated the ability of different doses of allogeneic islets (25–125 islet equivalents), transplanted into the anterior chamber of the eye, to reverse STZ-induced diabetes in male C57BL/6 mice, using non-diabetic and sham-treated diabetic mice as controls. The cumulative survival of mice from each recipient group was assessed for the time between transplantation and graft removal (days 0–47) and was positively correlated to the number of islets transplanted (Fig. 1a). During the 47 day study, five mice became moribund and were killed; two of these mice had received transplants of 25 islets (60% survival) and three were diabetic/sham-treated mice (25% survival). All of the mice that received 50, 75 or 125 islets, as well as the non-diabetic control mice, survived over the same period (100% survival), indicating that transplantation of even 50 islets in the eye improved survival in mice with diabetes (Fig. 1a). Furthermore, the corresponding proportions of mice that experienced reversal of hyperglycaemia were 100%, 33%, 40% and 0% for those receiving 125, 75, 50 and 25 islets, respectively (Fig. 1b). Only recipients of 125 islets had fasting blood glucose levels significantly lower than sham-treated diabetic mice beginning 6 days post transplant; glucose levels in these mice were statistically indistinguishable from non-diabetic control mice between 12 and 47 days post transplant (Fig. 1c). Thus, transplant of 125 islets in the eye was sufficient to completely reverse fasting hyperglycaemia in insulin-dependent diabetic mice. In contrast, a dose of 125 islets transplanted under the kidney capsule of STZ-treated diabetic mice was insufficient to normalise blood glucose levels. A minimum of 200 islet equivalents was required to lower blood glucose when transplanted under the kidney capsule, but only 275 islets normalised blood glucose levels in a similar time frame to 125 islet equivalents in the eye (Fig. 1g). Mice that received transplants of 50, 75 or 125 islet equivalents gained weight faster than sham-treated mice (p < 0.05, electronic supplementary material [ESM] Fig. 1 and Fig. 1d), indicating that transplantation of as few as 50 islets in the eye could restore weight gain in mice with STZ-induced diabetes. The growth rate in recipients of 125 islets was statistically indistinguishable from that of control mice (p > 0.05, ESM Fig. 1 and Fig. 1d). In contrast, only mice that received doses of 200 or 275 islets transplanted under the kidney capsule tended to gain weight (Fig. 1h). An OGTT was performed to assess the ability of islet transplants to control glycaemia following a glucose challenge. Recipients of 75 or 125 islets in the eye showed near-normal glucose tolerance, similar to that shown by non-diabetic control mice, except for slightly elevated peak postprandial glucose levels (Fig. 1e). At 47 days post transplantation, recipients of 125 islets that were subjected to an OGTT had their transplants removed via enucleation to determine whether the observed changes in glucose control were due to the direct action of the transplanted islets. Three non-diabetic control mice were also enucleated at the same time. Islet recipients rapidly became hyperglycaemic (blood glucose ≥25.4 mmol/l) within 1 day of enucleation, indicating that these mice were highly dependent on the transplanted islets for glucose control (Fig. 1f). The morphology of engrafted islets under the kidney capsule and in the anterior chamber of the eye was compared by immunofluorescent staining. In both transplant sites, the engrafted islets clustered and formed an endocrine cell mass containing insulin-producing beta cells and glucagon-producing alpha cells (Fig. 2). It is well established that islets transplanted under the kidney capsule become highly vascularised . Islet grafts within the anterior chamber became highly vascularised within several days of transplantation, generally via a large vessel running through the transplanted area with many small branches supplying different graft regions (ESM Video 1). To compare autoimmune destruction of endogenous and engrafted allogeneic islets, NOD-SCID mice received donor NOD-SCID mouse islet transplants in the anterior chamber. To accelerate the natural process of autoimmune islet destruction, splenocytes from newly diabetic NOD mice were isolated for adoptive transfer into NOD-SCID islet transplant recipients. Engrafted islets were imaged in the eye four times before adoptive transfer of splenocytes and then regularly following the adoptive transfer to assess changes in islet vascularisation and morphology. Morphological characteristics of the transplanted islets before and after adoptive transfer are described in Table 1, including the formation of ruffled edges (irregular, non-smooth borders around transplanted pancreatic islets), holes in the transplant and changes in transparency. Islet transparency was graded on a scale of 0–3, ranging from no detectable transparency (grade 0) to greater than 50% transparency or evidence of holes (grade 3). Figure 3 and ESM Fig. 2 illustrate the progression of disease via representative images of transplants at different time points. Four weeks after the adoptive transfer, most of the islet grafts had decreased in size and developed areas of transparency and/or ruffled edges, possible indications of islet cell apoptosis (Fig. 3, Table 1). Moreover, subtle changes in islet morphology were visible as early as 19 days post adoptive transfer (Fig. 3, Table 1). To determine whether autoimmune destruction of engrafted islets within the eye was also reflected in islets within the endogenous pancreas, we evaluated insulitis in the pancreas and engrafted eye sections from nine islet transplant recipient mice following adoptive transfer of splenocytes. We also examined engrafted eye and pancreas tissues from NOD mice undergoing spontaneous disease progression (i.e. no adoptive transfer), before the onset of diabetes. Interestingly, in both models, the pattern of insulitis was remarkably similar between endogenous islets in the pancreas and islets transplanted into the anterior chamber of the eye (Fig. 4). Insulitis scores for islets within the pancreas and the eye were significantly correlated (r = 0.81, p < 0.05; Fig. 5), indicating that the degree of autoimmune attack on islets transplanted in the eye mirrors that in the pancreas. In these studies we demonstrate that the anterior chamber of the eye is a highly effective site for functional islet transplantation, even more so than the kidney capsule transplant site traditionally used in animal models. Gross morphology and vascularisation of engrafted islets can easily be monitored in the eye with non-invasive imaging, as opposed to the kidney capsule, which requires a surgical procedure to externalise and visualise engrafted tissue. Our data demonstrate that autoimmune destruction of engrafted islets within the eye could be easily visualised and mirrored subclinical autoimmune processes occurring in endogenous pancreatic islets. These findings suggest a possible future avenue for mechanistic evaluation of islet autoimmunity using non-invasive in vivo imaging at cellular resolution. Previous studies demonstrated that the anterior chamber of the eye was a safe and suitable site for islet engraftment in rodents [16, 17] and baboons . The current study extends these findings to demonstrate that a remarkably low number of syngeneic islets transplanted in the eye yields significant physiological effects. Transplantation of as few as 50 islets in the eye improved survival of mice with diabetes, while transplantation of 125 islets completely reversed diabetic symptoms. More than double this number of islets was required to achieve the same effect when they were transplanted under the kidney capsule (Fig. 1g). The better outcome in the eye may be related to the rapid vascularisation that occurs at this site, which may promote better survival and engraftment of the transplanted cells compared with the kidney site. Current islet transplantation protocols in humans require islets to be isolated from two donor pancreases to treat a single patient, with recipient demand far exceeding donor supply . The remarkable efficiency we observed when transplanting islets into the eye of rodents suggests that additional optimisation of current islet transplantation protocols may enable a drastic decrease in the islet volumes required for successful treatment of diabetes in humans. A clear advantage of the eye over traditional transplant sites is the ability to non-invasively monitor the transplanted cells over time. We used in vivo imaging to demonstrate that engrafted islets remain intact in distinct clusters following transplantation, and that the graft tissue was vascularised within a few days of transplantation. This agrees with previous observations that transplanted tissue in the anterior chamber of the eye becomes vascularised within 24 h . We predicted that the destruction of islets transplanted into the eye might occur in tandem with autoimmune destruction of pancreatic islets. To test this we monitored natural diabetes development and diabetes development following adoptive transfer of diabetogenic splenocytes in NOD-SCID mice. We chose not to use reporter proteins so that we could exclude any possibility of immune responses toward non-self proteins. Our data support the notion that autoimmune destruction of islets occurs simultaneously in the eye and in the pancreas in this model. The strong correlation between the degree of islet destruction in the pancreas and eye support our hypothesis that in vivo imaging of islet grafts in the eye can enable real-time tracking of diabetes progression in the pancreas. As early as 2 weeks following transfer of splenocytes from newly diabetic NOD mice, we observed subtle changes in islet morphology that were indicative of islet destruction. When the mice were killed, we confirmed that immune cell infiltration was present in islets in both the pancreas and the eye, suggesting that disease progression was underway even though these mice were not yet overtly hyperglycaemic. Abdulreda et al  showed the feasibility of studying immune attack of transplanted islets in the anterior chamber of the eye. They transplanted pancreatic islets with mismatched major histocompatibility complex into the eye. By tracking immune cell infiltration into the engrafted tissue via fluorescent T cells, they demonstrated the practicality of this model for visualising islet allograft rejection. However, they did not address whether the eye is an appropriate site to evaluate islet autoimmunity. Our study shows proof of principle that anterior chamber islet transplantation can enable visualisation and monitoring of autoimmune attack against pancreatic islets and suggests that this model may be appropriate for studying interventions that could modify disease progression. In our study we did not incorporate any fluorescent reporter in either islets or T cells to directly evaluate autoimmune attack of pancreatic islets and rule out the possibility of immune attack against reporter proteins. Instead, we illustrated with basic, non-fluorescent imaging the feasibility of using the eye as a model to visualise diabetic autoimmune attack. Future studies could use fluorescent reporters to track autoimmune processes in greater detail. Immune privilege within the eye is thought to be an evolutionary adaptation designed to protect the eye from bystander effects of inflammation. However, under some circumstances ocular immune privilege is lost (e.g. allogeneic cornea grafts are no longer protected from immune rejection ). The current study and that of Abdulreda et al  support the notion that pancreatic islets are not protected from autoimmune processes when transplanted into the anterior chamber. This breaching of the normal immune privileged status of the anterior chamber may be due to mechanical damage during surgical procedures and/or due to angiogenic factors from transplanted islets that lead to revascularisation of the islet graft, making it accessible to the recipient’s immune system. Our studies provide compelling evidence supporting the eye as an excellent site for functional islet transplantation to treat diabetes and also to monitor survival of transplanted islets in real time. Importantly, we demonstrated that the process of autoimmune destruction of islets in the eye reflects that occurring within the endogenous pancreas, a site that cannot be visualised non-invasively using current imaging modalities. To our knowledge, this is the first study to demonstrate a means to track progression of beta cell autoimmunity over the course of type 1 diabetes development. The eye provides a unique opportunity for future studies using fluorescent probes in vivo to identify the phenotypes of the cells attacking the islets in real time as well as to investigate novel therapeutic strategies. The authors acknowledge editorial support from Rhonda Wideman, Life Sciences Institute, University of British Columbia, Vancouver, BC, Canada. Majid Mojibian and Jennifer E. Bruin are grateful recipients of JDRF postdoctoral fellowships and awards from the Canadian Institutes of Health Research/Michael Smith Foundation for Health Research (CIHR/MSFHR) Strategic Training Program in Transplant Research. Jennifer E. Bruin is a recipient of the L’Oreal Canada For Women in Science Research Excellence Fellowship. Timothy J. Kieffer was a Senior Scholar of the MSFHR. This project received funding support from the JDRF and the Canadian Diabetes Association. MM, BH, AH, AA and JEB designed the experimental approach and acquired, analysed and interpreted data. MM and BH drafted the manuscript. TJK designed the experimental approach and contributed to discussion and revising the manuscript critically for intellectual content. All authors revised and approved the final manuscript.